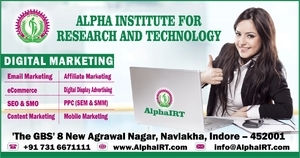 AlphaIRT renders their student with numerous courses divided into sub-categories which you can choose accordingly. For example; if you're looking for a particular course, say it Affiliate Marketing, Email Marketing, Digital Advertising, then you can choose the Basic Diploma Course in that case. This course also includes courses such as; Pay per Click (PPC), SEM, SMM and much more.